For a few years now, Simon Sinek’s notion of The Golden Circle has been popular, especially in the corporate world. In his books and his TED Talks, Sinek points to the powerful simplicity of the idea. By understanding their what, how and why, organizations and people can maximize their potential and their well-being. Sinek uses a simple diagram of three successively smaller overlapping circles to show the relationship among what, how and why. What (outer circle) reflects the things that organizations or people do. How (middle circle) reflects how organizations or people do what they do. Why (inner circle) reflects the essential reason(s) that organizations or people do what they do. Sinek goes on to say that most organizations and people know what they do and how they do it, but fewer know their why. Sinek points to the example of Apple as a company that not only understands its what (we make excellent computers) and its how (the computers are user-friendly and beautifully designed), but also its why (we think differently and challenge the status quo). The result of knowing your why is a powerful guiding force that can keep an organization or a person perpetually and highly motivated. For the most part, Olympians are wonderful examples of people who “know their why.” As the school year begins, we can easily look to Olympians and the Olympic spirit for motivation to pursue our most important goals. I have been an Olympics enthusiast ever since I can remember. In the summer of 1972, I remember watching the “darling of Munich” Olga Corbut captivate the world with her gymnastic prowess and Mark Spitz amaze the world with his seven swimming gold medals (each one a world record). I remember the perfect 10’s of Nadia Comăneci from 1976 in Montreal and the Miracle on Ice from the 1980 Lake Placid Winter Olympics. The Olympics are such a wonderful stage for all that is good about people (and some that is not good). No reality TV show can hold a candle to the stories that play-out on the Olympic stage. The story of Abebe Bikila is one of my favorite examples. I can point directly to Abebe Bikila as the reason for my dream to run a marathon. Bikila was born poor in Ethiopia. Purely by chance, Bikila was identified as a person who might have some potential to run long distances competitively. Four years later, as Bikila was nearing the end of his training for the 1964 Tokyo Olympics he developed acute appendicitis. He had an emergency appendectomy and was not expected to defend his Olympic Marathon gold medal. Not only did he compete, but he set a new Olympic record time of 2:12:11 (wearing shoes). Bikila returned to Ethiopia to a hero’s welcome. The story of Abebe Bikila highlights all that is good about the Olympic spirit and the human spirit. It also shows that to overcome the many obstacles in his path on the road to two Olympic marathon gold medals, his inspiration had to have come from a deep-seated why. Abebe Bikila was my why to run a marathon. As a youngster, I clearly remember watching the documentary series called The Olympiad and learning about Abebe Bikila in one of the episodes. From that day on, I was determined to one day run a marathon, which I did, twice. So as we try to accomplish our goals, while at the same time hurdling life’s inevitable barriers, knowing your why is often the foundational source of motivation. The confluence of the Olympics with the start a new school year is a wonderful time to embrace the Olympic motto Citius, Altius, Fortius (Faster, Higher, Stronger) and to think about your why(s) and how to help your children figure out their why(s). Great schools can help you in this process. Sure enough, schools have to deliver on what and how, but it’s the why that perpetually motivates the student. Schools have a vested interest in finding your child’s why. At Currey Ingram, we help students discover their why by intentionally developing student strengths, involving students in reflection and goal-setting, and using personalized plans for every student. Other schools may do this differently. Talk to your child’s teachers about this idea and your dreams for your child. A good school-to-home partnership and a shared commitment to why can reap enormous benefits for all involved. Best of luck to all parents in these first weeks of the 2016-2017 school year. I look forward to writing several more articles on this theme. Dr. Jeffrey L. Mitchell is the head of school for Currey Ingram Academy. 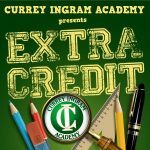 “Extra Credit” is provided each month by Currey Ingram Academy to help parents at all schools and at all stages of the parenting journey. Currey Ingram Academy is a coed, independent K-12 school in Brentwood for students with learning differences such as dyslexia and ADHD. For more information, click here.